Today's Times notes that David Cameron "will today propose a powerful new independent body charged with requiring future governments to stick to agreed year-by-year reductions in carbon emissions". This appears to be in line with the climate change recommendations published by Oliver Letwin a fortnight ago. Mr Letwin's recommendation of "independent verification" of "year-on-year carbon reduction requirements" - made jointly with LibDem MP Norman Baker - was examined at the time on conservativehome's Commentators Blog. 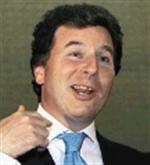 Mr Letwin is emerging as a powerful force within the Cameron camp. Mr Letwin's own belief that the Tories should probably not promise tax cuts at the next election is thought to explain the 'sharing the proceeds of growth' formulation being used by Mr Cameron when it comes to issues of tax. No, Camemron, NO! This is DIRE! 1) Global warming appears to be a reality, but one thing we know for certain: Kyoto-style grandstanding will make no difference. Technology is much more likely to solve the problem than miniscule symbolic acts. Support technological development, not the anti-capitalist green lobby. 3) Even if cutting carbon emissions by decree were the answer, why on earth do you need a 'powerful new' commission? Governments do it or they don't. They can overrule a commission any time they want, even if you declare it to be 'powerful'. It seems you're a big-government bureaucrat into the bargain! The commission bit is especially disappointing. It shows that Cameron is just a gesture-politician. We've already had Osborne's 'commission on flat tax', setting out a 'direction' which is just as quickly repudiated. This is even sillier. The problem with these wannabe vote-catchers is that they want to be popular with a tiny coterie of metropolitan bien pensants, and really don't understand the modern world at all. This is the worst possible time for Blair-Lite - just when the country wises up! Some of us are trying very hard to come onside with our lovely new leader, so this is a sad day: our lovely new leader has revealed himself to be a fool. I think I preferred 'vague'. Oliver Letwin is a great man, and one is grateful for his civilising presence in our party, but he tends to be wrong on almost everything. This muddled attempt to appear green is... well, very green. Bux, having trouble counting? Or did you censor yourself? "propose a powerful new independent body charged with requiring future governments to stick to agreed year-by-year reductions in carbon emissions"
Governments simply do not have the power to do this. They cannot control energy markets, technological development or individual/corporate demand on a year-to-year basis. Sorry guys but if we wait for the technology to change then hundreds of thousands of people will die. Of course Kyoto is not the answer but we already have climate change for the next 30yrs, and could reach the point of no return in as little as a decade. The only technology which is likely to change this is Nuclear Fusion which is at least 30yrs in the making and would then have to be rolled out at huge costs (by which point the global economy could have been shattered). Added to that the rate of technological discoveries has been slowing year on year since the late 1800s and there is no way that something is just going to spring up out of the blue. If we don't control global carbon emissions then we are all screwed Bush's cowardly "wait for technology to change" is a disgusting dereliction of duty and the man should be shot. Wasp: "Sorry guys but if we wait for the technology to change then hundreds of thousands of people will die." These are the sentiment of the silliest of the greens. WE KNOW that cutting emission as per Kyoto makes almost no difference. It is just a gesture. Only technology can make an impact. Technology is much faster than Kyoto in its wildest dreams! Wasp, you make the case perfectly for why imitating Labour is pathetic. If Cameron's planning to introduce some chunky new environmental regulations, sounds like more advisory work for me. That will jump start my personal economy for sure. I'll be able to buy a bigger 4x4. (1) The poorly structured Kyoto treaty (the wrong targets, too few participants) does not mean that the principle of international binding commitment is wrong. On the contrary this approach is necessary if the bigtime polluters of the world are to make progress without some of them gaining an unfair competitive advantage over the others. (2) The targets approach is not incompatible with the technology approach. Indeed, they are mutually dependent. After all, where do you think the investment for all that lovely new tech will come from if Governments don't create a policy framework within which the market provides the right incentives? (3)Nuclear fusion is certainly not the only answer. There are numerous solutions at hand or nearly at hand. Not least among these is energy efficiency -- which we could be implementing to German standards now. This would actually save us money as well as carbon. Other bright hopes include carbon capture and storage, combined heat and power and microgrid technology. We do not have to choose between nukes and windmills. This is gesture politics of the worst kind. Even Blair is wising up to the lunacy of Kyoto, as the Americans did years ago. Driving down UK growth while allowing China, India and the USA to generate greenhouse gases on an unprecedented scale is simply a recipe for poverty but does not nothing to reduce global warming. The UK needs to abandon the use of non-renewable fossil fuels and switch to Alternative Energy sources including biofuels such as Rapeseed Oil, in the short term though Nuclear Power is the only replacement for coal, liquid petroleum, crude oil and Natural Gas. Britain's Natural Gas and Oil reserves have largely run down and what coal remains is in increasingly difficult areas to get at - so what's the alternative to import supplies from abroad leaving the UK reliant on Kazakhstan or Iran maybe? The UK has to aim to secure an indigenously based reliable energy supply as well as reducing emissions of Greenhouse Gases for economic and security interests among others. Dire, indeed! I am bitterly, bitterly disappointed at this. I thought that Cameron was a clever, educated man. The briefest of readings of scientific papers would show him that most of the "Global Warming" Scare is utter garbage. The temperature of the world goes up and down all the time. There is nothing special about the present temperature. The amount of CO2 in the atmosphere is tiny. Even in terms of "greenhouse gases", the contribution of CO2 is so small as to be almost negligible. Moreover, the proportion of total CO2 caused by human activities is itself miniscule. As far as can be measured, in all previous uptrends in temperature, the proportion of CO2 in the atmosphere has been a lagging indicator. It is likely, then, that the present slight increase in CO2 is a result of a slight increase in temperature, rather than a cause of anything. In addition the cost of energy supply needs to be made more expensive to encourage people to optimise their usage, levies relating to usage on electricity bills could be used to fund new Alternative Energy research and building new facilities, equally I rather favour the purchase of the shares by such methods to create Private Charities Limited by Guarantee. Surely an extension of the decentralisation of economic and infrastructural control of the country could include downsizing the Civil Service radically and transferring Health, Education, Social Services, the Bank of England, Ordnance Survey, Met Office and most of the rest of the public sector and also move many of the privatised utilities to private charities limited by guarantee with boards comprising a mixture of government appointees, employee representatives and the people using such organisations such as parents and patient groups and these can then be funded by charging for services to cover costs thereby freeing up money for substantial tax cuts and investment in the Armed Forces, Police, Security Services, Transport Infrastructure, Environmental Projects and Civilian R&D - technology is the driving force behind economic growth and taxes have to be cut and the labour market deregulated to encourage a return to the mercantilism in the 18th and 19th centuries that pushed the UK to being the richest country in the world. I can't belive some of this discussion!! Next some will peddle the George w Bush view "Global warming? What global warming?" In terms of total energy the contribution of Greenhouse Gases and artifically released energy is a small proportion however freezing point of water is not absolute zero, -273.16C is absolute zero - without the Greenhouse gases naturally occurring in the atmosphere the average world temperature would be 20C (20K) cooler, levels of Greenhouse Gases (and Methane (CH4) traps 10 times the amount of energy that CO2 does) though have been increasing and average world temperatures have been increasing and increasingly some of the extreme weather that the earth has been getting is attributable to such changes, equally there is a reversal of Global Dimming as cleaner air has been resulting in more sunshine reaching the earth than at any time since before the Industrial Revolution and so temperatures have been rising and it is believed this may have been the cause of the unusually hot summer in Europe in 2003 and when the planes were grounded after 09/11/2001 a sharp increase in temeperatures across the world was recorded in one day, the first hurricanes in the Southern Hemisphere have been recorded and Britain's climate has become stormier and warmer, the intensity of storms across the world has been increasing and recently it has been found that the North Atlantic Drift has been slowing down (once it stops it takes 10,000 years to start again) which could mean that while the world climate warms on average that the climate of Western Europe may not in the next century and there may even be a sudden drop in temperatures in Western Europe taking only a couple of winters if it stops suddenly meaning that the winter of 1947 would become the norm, even if there is no temperature changes in Western Europe there are still increased flood risks from higher sea levels and increased intensity of storms to deal with. Then there is the matter of the Ozone Layer which has holes appearing around both poles and thinning around that (in the Spring in the Northern Hemisphere) and some Greenhouse Gases as well as things such as CFC's also destroy Ozone, it is places in High Latitudes that are most affected and so for example Ozone over the UK especially the North West of Scotland each Spring thins substantially before recocvering to some extent so UV levels notably off the West of Scotland especially UVA which is reckoned to be the most harmful to organic lifeforms rockets! There are of course natural contributors to Global Warming such as increased volcanic activity and increased output from the sun but human activity is one of the major if not the main cause of global warming since the 19th century. Once bioechnology can convert waste agricultural products such as straw into ethanol and fuel cell technology can burn hydrogen converted fom water the world will be moving ahead with fuels cheaper than non renewables. If Oliver letwyn asked Rolls Royce what they need to speed up their fuel cell programme and to how to bring the hydrogen economy a few steps nearer he wuld do a lot more good than setting Soviet era targets for carbon reduction. Are the Conservatives now abandoning intelligence and accepting as standard New Labour's dumbed down media managed sterility? The word is mediocracy. Are Cameron and Letwyn aiming to be mediacratic as well as mediocre? How long will it take for this technology to be built and making an actual impact? Im guessing its going to take a good while. Oh great. The Cameronite response to one of the biggest challenges facing mankind is to establish yet another quango. Brilliant. We're meant to be looking to tackle the problem of hot air, not generating even more of it! The issue of climate change requires real, practical solutions, not token gestures. This sort of Blairesque posture politics is typical of the Cameron campaign. After eight years of this tripe from New Labour, don't we deserve something different? Looks to me like Oliver Letwin is doing a decent job of raising an issue this party has been weak on. The technology argument is the long term answer, but in a world where it appears we may already have been too slow to act (and where OPEC appears more powerful than the UN), waiting for technology isn't an option. I also have to disagree with those who back GWB over his 'alternative to Kyoto', he rejected Kyoto soon after election with no alternative, and eventually after a few years came up with a plan. He contributed to the view that the 'right' would rather look themselves in a dark room rather than admit that there would need to be some restraints put on the market to ease the problem of global warming and low fossil fuel supplies. It is important Letwin speaks out on issues like global warming or it will simply become the realm of left wing parties. Although I would have liked him to been a bit stronger on the recommendations. It's another grotesque distortion to accuse Cameron of being a Blair clone. The Times article makes it clear that this proposal is non-party political. "The Shadow Education Secretary, who has been accused by his opponents in the Tory leadership race of being policy-light, will set out a radical new approach to tackling climate change by trying to take the politics out of it." When are we going to get beyond the old left/right arguments? Change the record to win. "How long will it take for this technology to be built and making an actual impact? Im guessing its going to take a good while." Much less, I'm guessing, than Kyoto-style accords! They will never make an impact. "It is important Letwin speaks out on issues like global warming or it will simply become the realm of left wing parties." Completely agree - it is a good thing. We must stake our claim to this issue, take it seriously, have convincing solutions. A "powerful new body" isn't one of them! "Even in terms of "greenhouse gases", the contribution of CO2 is so small as to be almost negligible." This is not true. The most common greenhouse gas is water vapour, but the amount of water vapour in the atmosphere is a function of how hot it is. However, the story with carbon dioxide (the next most common greenhouse gas) is very different. Since the industrial revolution, concentrations have gone up by a third largely as a result of people burning fossil fuels. If we carry on burning fossil fuels at the current rate then concentrations will get even higher. "As far as can be measured, in all previous uptrends in temperature, the proportion of CO2 in the atmosphere has been a lagging indicator." This is a completely invalid comparison between trends taking place over tens of thousands of years and the unprecedented events of the last 200 years. I hate the way that certain dodgy think tanks use pieces of real science and then miscontextualise them to deceive people who clearly don't know better. Why do some people think that we shouldnt even bother to use Kyoto style treaties? If they make a good impact they should be used. What is this radical new approach? There's nothing radical or new about following the New Labour path of establishing a quango (or 'powerful new independent body' in Blairspeak) that will no doubt 'look at possible solutions' (in the same way that drivers on a motorway look at an accident, whilst doing nothing about it), 'formulate proposals' (which will be ignored unless they suit the government's goals) and 'guide policy initiatives' (in other words, a tenuous link will be made between any policy actually offered and an obscure quote from a member of the quango). A radical new approach would actually be offering some practical solutions instead of token gestures and posture politics - we've had enough of that from Princess Tony and the New Labour court jesters and a repeat performance from David Cameron just won't wash, I'm afraid.